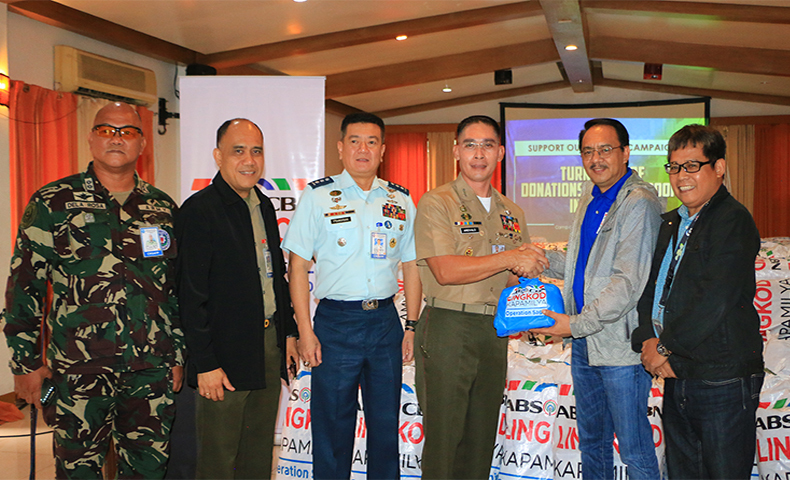 Operation Sagip of Lingkod Kapamilya recently turned over 3,000 packs of hygiene kits to Civil Relations Service of Armed Forces of the Philippines, to be given to the troops battling in the on-going conflict in Marawi. In photo (L-R): LTC. Glenn dela Rosa (Group Commander of Headquarters and Headquarters Service Group, CRS-AFP), Col. Noel dela Cruz (Assistant Chief of Staff for Operations, CRS-AFP), Col. Anthony Francisco Jr., Philippine Air Force (Chief of Staff, CRS-AFP), Col. Edgard Arevalo, Philippine Navy Marines (Deputy Commander CRS-AFP, Chief PAO-AFP), Higino Dungo, Jr. (Program Director, Operation Sagip), and Marcel Riñon (Deputy Director, Operation Sagip). The kits include a shirt, face towel, underwears, pairs of socks, toothpaste and toothbrushes, bath soaps and laundry soaps, pack of biscuits, a bottle of liniment, and a pack of wipes. Last July 3, ABS-CBN Lingkod Kapamilya Foundation’s emergency humanitarian program initially turned over 700 packs of hygiene kits to CSR-AFP. As of July 18, Operation Sagip already reached 20,610 families or 103,005 individuals affected by the conflict in Marawi with food packs during its relief operations.